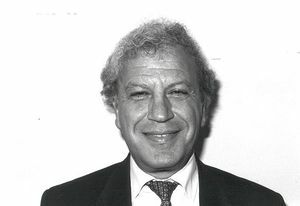 Anthony Constantinides went to Regent Street Polytechnic, then to London University for an undergraduate degree in electrical engineering (1965) and a PhD (1968) in applied mathematical topics. His dissertation was on network theory and digital signal processing. After a few years working at the Post Office, unsuccessfully urging them to switch quickly to digital techniques, he moved to the Imperial College, where he has taught ever since. He has made his career in the field of digital filter design, organizing the Digital Filtering Symposium (biennial from1967), European associations (European Association for Signal Processing) and journals in digital filtering (ca. 1970), seminars, teaching graduate students, and doing research of his own (lately modeling signals which are non-stationary, non-Gaussian, non-linear operations). He notes that Europe has had a more theoretical approach than the US, if only because it does not have the financial support, particularly from industry, for applied R&D. Constantinides was awarded the IEEE Leon K. Kirchmayer Graduate Teaching Award in 2011. He also works on prehistoric Aegean archeology. Interview # 353 For the IEEE History Center, The Institute of Electrical and Electronics Engineering, Inc. This manuscript is being made available for research purposes only. All literary rights in the manuscript, including the right to publish, are reserved to the IEEE History Center. No part of the manuscript may be quoted for publication without the written permission of the Director of the IEEE History Center. Anthony Constantinides, an oral history conducted in 1999 by Frederik Nebeker, IEEE History Center, Hoboken, NJ, USA. It’s the 19th of February, 1999. I'm talking with Anthony Constantinides in his office in London. This is Rik Nebeker. Could we start with your telling me where and when you were born and a little bit about your family? Right. I was born in Cyprus in 1943. The 1st of January, actually. New Year's Day, 1943, during the War. I came to England quite young, I was about 16 at the time I came over. The purpose of my visit then was to see whether I could study in England. I found I could with the support from my family. I followed an engineering course with a few other things besides, which I'm going to come to that shortly, but I'll go back to my family, because you asked about my family background as well. My father is a civil engineer, and he is still alive. He's an old man, but he still tells me what I should do and what I shouldn't do! (laughs) I have two brothers, who are also engineers. I am the middle one. So, we are a very engineering-based family. The studies that I followed in London were in Engineering at London University. So at 16 you started? No, at 18 I started at London University. The first two years in accordance with the then regulations for tech education in England were devoted to the matriculation studies, which would then enable you to enter a university course anywhere in the UK. I had to do those. Where did you do those? I did those at a place which now doesn’t exist. It used to be called Regent Street Poly. Actually, it exists under another name. Regent Street Poly, I see. Right. It now exists as Westminster University or University of Westminster, but in those days it was a Polytechnic. The Polytechnic as it was called. The Polytechnic at Regent Street. I see. You told me I think that the University of London was called City University? No, I did my Ph.D. at London University, but based at City University. It was one of those regulations where I did my Ph.D. external to the University of London. Incidentally, is the computer noise being recorded at the same time? Shall we switch that off you think? I don’t think it’s a problem. So the City University was something different? Something different, yes. The City University was something different, a different entity. It was something that came into being in the middle '60s as a result of a governmental action to change some of the technical colleges that were around the UK at the time into universities. The City University was created at the stroke of a pen. I know that British education has traditionally been humanities based and the technical fields haven’t been, perhaps, represented at the university level. To the same extent. That’s right. So you got an undergraduate degree? I did an undergraduate degree at London University and the Ph.D. at London University as well, only my Ph.D. was external to London. The University of London, just as a parenthesis, is a collegiate university which has many colleges that are almost autonomous, but it also has the concept of an external degree that you can be a student anywhere in the world and belong to London University as long as you have the right qualifications and you have been matriculated correctly. I see. So your undergraduate degree was in electrical engineering? Yes, in Electrical Engineering, that's right. Would you tell me something about your graduate training and what you eventually did your thesis on? I finished my first degree in 1965, I think. Then during the degree I took some time off and I spent it in industry because life is very expensive in England, and I had to work for my education. So I had to go earn money to keep body and soul together. This was after your undergraduate degree? I worked as a waiter. When I finished, I worked for about six months in industry. In a small company that made cables, which was later absorbed by BICC. It’s a big cable manufacturer in the UK. It was interesting to see what was important then in that it was relevant to industry in that sector of industry it was obviously not of interest to me. I thought the best thing to do then was to use the good grades, very good grades that I got in my first degree and since I already had two offers, automatic offers, for postgraduate studies. I thought that I'd take up one of them. I also had a job incidentally. At that time if you had-- if you came at the top of your class, with a First Class 1 as it's called in the UK, you had an automatic offer from the civil service to be admitted as a member of the civil service and therefore go and be sent abroad to represent British interests in science and technology. But I didn't. I went back to the university and then I had a grant and I didn't have to work as hard as I did during my undergraduate studies. What attracted you? What graduate studies did you pursue? I started looking into analytical subjects because I was very much interested in theoretical techniques, mathematically based approaches. And at that time, network theory, circuit theory, circuit synthesis, network synthesis, was very important. So I started researching into some problems concerned with positive real functions and functions which are driving point impedance’s of passive networks. I wanted to get the computer to tell me how they behaved over a wide range of frequencies when they are very complicated and you threw them together randomly. This sounds very much like applied mathematics? Well, yes, but you see it led me directly into DSP the moment I started writing programs for computers to implement differential equations. For that I had to discretize. And then it dawned upon me that dictretization need not be a process of taking a differential equation and but rather getting a proper difference equation. You can go back and look at difference equations of their own rather than in relation to differential equations. Gradually it went from there into signal processing. We didn't call it signal processing those days of course. A number of the engineers I've talked to, I'm thinking now of older ones such as Ernst Weber, have told me how in their graduate work they were driven toward trying to do calculations and using tables and various techniques, but what was different about it? Was this in the ‘60s when you were doing this? It was the case then, that the computer is fairly newly available, and as you say you then are forced to do it with discrete techniques if you’re going to program the computer to carry out these calculations? That’s right. The computers that we had then of course had a tenth of the power that a hand held calculator now has, but you had to program them. Not with the super-sophisticated systems that we have now. Upgrading systems and languages, but had to be hand programmed in machine code. So I had to write the code that would take a number and place it in a specific memory location an assembler type of code (later on, it was called assembler). That’s what actually made it clear that was a different kind of operation altogether from the kind of operation that you meet in analog systems. And you came to this because of your interest in network theory? And trying to learn how they behaved in certain conditions? Yes, and trying to simulate that behavior over range of frequencies. Do you remember what computer it was you had access to? Yes, it was a UK Ferranti Pegasus computer. Okay. And was that usual at that time for someone to do a purely calculational Ph.D.? Constantinides: Not at all. It was in fact highly unusual. The young ones like myself who thought there's this wonderful thing called the computer, why don't we use it to get things done more quickly. Of course, that’s relative, for instead of doing calculations by hand on a hand cranked calculator, you punched cards and you fed them through a window to an unknown person. You only knew the hands of that person. A week later you'll get a print out with fifteen different mistakes and you hope that after a month you'll convert to no mistakes. That was quick! My thesis advisor was George Brayshaw. B-r-a-y-s-h-a-w. He was a network theorist. Is this something he himself had attempted, simulating network behavior on a computer? No, actually it's something that I actually foisted on him. He was an old man at the time. At least I thought he was old. He was my present age at the time and between us I am not that old! As a young man I put it to him that we need to get simulations going to try and see how randomly connected networks could conceivably behave. And the only way to do that is to write some software. Your interest in the behavior of networks, was that a more theoretical abstract interest or was it tied to some application? It was completely devoid of application. It was a theoretical subject. So you studied network theory and here was an important question and you were going to use the computer to try to understand. And how did that work go? Well, it went very well. Very soon after I started doing the simulations, within the next few months, it was clearly (much because I'd run the program twice or three times) it was clearly obvious that I was not dealing with the same beast. This result was a different kind of entity. I keep repeating myself, but this is very important. This is the watershed. This is where it happened. We're no longer dealing with networks. We're no longer dealing filters of the classical type. It's something different. And how different is it? That's how the whole thing started, from there. Now one would think that a person developing the engineering theory for networks or classical filters would think that what is always of ultimate importance is the behavior of those analog systems, and that indeed one might use digital techniques to understand them, but it was always the actual circuitry that was important. But you say you began to think that this kind of behavior that you’re simulating on the computer is itself the object of importance? That's right. In order to be able to see the impact, the light comes on when there's confluence of different things. At least that's my theory. The light comes on at that time. Now, from this point in time you go back and say why didn't we do it earlier? Because during the war the concept of controlling simple control systems, digitally, had evolved. But the procedure then was to take the differential equations and use “d by dt” as the difference between two different successive measurements of some variable. And that's how it evolved. In fact, if you look at the early work on digital filters as presented by Jim Kaiser, you'll find that he carries that weight around with him because he approximates; takes the bilinear transformation, as a means of improving the approximation of the integral operator. But the integrator is a continuous variable whereas in digital computers we're not actually talking about continuous variables. So there's that burden that we carried around with us for a little while until we realized that something else is happening. Now I can understand that in pure mathematics that there were people who became interested in discrete mathematics and difference equations and that subject in its own right and treated that as every bit as seriously and so on as classical continuous mathematics. I also understand this simulating of analog systems digitally. What I think is a very important point, and I want to hear your view and your own experience, what is surprising is that people in engineering either from sort of a theoretical abstract point of view decide that the digital discrete techniques are important or from the hardware side decide okay we’ll do this control system digitally. There were of course the telephone switching system is a discrete control system. There were earlier ones like that, but still I think with filters and so on people were thinking in terms of the analog circuitry. So how do we get into this new realm? Right. Having that kind of machinery, one could do very complex operations. Exactly, and it would be different. Operations are different nature because you’re not dealing with voltages and currents directly. So you said you very quickly got some interesting results. Yes, very quickly. I tried initially to see whether there was anything available. There was one paper that was published by Tustin in the IEE proceedings which very interestingly enough developed a theory for operating with sequences of numbers. And developed actually convolution, but in a very specific way. He was head of department here at Imperial College in the 1940’s. He developed also the bilinear transformation, but again in a very peculiar way, which was very difficult to understand unless you knew what it was about. That I think was 1946 or 1947. That was the earliest I could find. The only written work was the work by Jim Kaiser. In the book by Frank Kuo, I think it's called Digital Control, there's a chapter which was written by Jim on digital filters. I think it's called Digital Filtering or something like that. It was the earliest reference to that. He was dealing with the bilinear transform as a means of getting transfer functions for filters. And then I asked the question, "Okay this man is talking about is such that you need to have a transfer function of an analog system. How do you get it directly into a digital form?" I want to know whether I can design a digital one ab initio, from the very beginning without any reference to a pre-existing analog transfer function. And that was because of your confidence that there would be appropriate hardware for building such processes? Exactly, and that's how I started with. Actually, I struggled a bit initially, because I wasn't quite sure how to formulate the problem. It is always the case that once you formulate the problem, then the rest follows I think. Ninety percent of the problem is formulating it! The other ten percent is just scribbling. So, it took me about a year and then I started producing results. After that, it was a virgin land because there was nothing published. Indeed, any rubbish that I thought about and committed to paper would be published, but not initially. We all had initial problems as to where to publish, but I'm sure you met this with other people that you've talked to with any new disciplines. Initially, we had a lot of difficulties in getting our papers accepted. Those of us who finally decided that we had a new and different discipline that needed its own theory, its own foundations, and its own development, had the problem finding a home for our publications. Where did you first find places to publish? My first paper ever was published in Electronics Letters. That was useful because the then editor was very forward looking and he would accept very weird papers on weird subjects. Then after that were in the proceedings of the IEEE and correspondence items and in the Circuits and Systems. The Transactions of Circuits and Systems. You said that a calculational thesis was unusual at that time. What was your thesis actually called? What was the title? I think the title was, if I remember quite correctly, "Design of Digital Filters from Prescribed Amplitude Characteristics. " That must have been the first Ph.D. thesis on digital filters. Was there a problem convincing your advisor that this was a thesis? It was a problem convincing both the advisor and the external examiner. The advisor, because it was a completely computational problem. I'll tell you a joke also about this shortly. The external examiner who said to me, "But where is the transfer function? If you sample a signal you don't have one frequency. You have many frequencies," which is true because of the repetitive nature of the spectrum. "So how do you have a transfer function?" I remember spending a whole day thinking about it because we broke it. I want to think about it. I came back and I argued and argued and argued and finally I convinced him that there was a transfer function. I used acoustics as an example to illustrate this with a simple operation in which you put a sound wave in and you get a sound wave out of the same frequency of different amplitude and phase. I recall a NATO meeting in Brussels at which a famous Frenchman, maybe a couple of years later, where I was invited to address the great and good of circuits and systems on the subject of Digital Filters. And there was this world authority on filters Mr Colin who sat in the front row with his eyes half closed, eyebrows half mast. I started putting equations on the board. He immediately interrupted and said, "Where are the filters?" I was a young man at the time, and all these great people there in the front row…….. I was trembling with tension and then there was Belevitch sitting next to Colin. Belevitch looked at Colin at once and said the filter is in here, pointing at one of my equations. But Colin wanted to see inductors and capacitors and asked "Where are they? Where are these inductors and capacitors?" Then Belevitch said to him, "Look, what he's talking about is what your grandchildren will be using. So shut up and listen." Belevitch was very acute and his vision was absolutely-- he could see very profoundly, very deeply. So you did convince your advisor and outside examiner, and received your Ph.D.? Do you recall the year of that? ’68. I think you then told me you went to work for industry for the British Post Office. That's right I went to work for the Post Office Research Department at Dollis Hill, which was a very well known place because that's where a lot of the work on the deciphering of the German Enigma code in WWII using the Colossus digital machine. In fact, I moved in I was shown my office on the Ground floor of a building, no windows because it was the secret building in which the Colossus machine was built in WWII. Anyway, I went there and I stayed there for I think two years. I remember the problems I had in convincing industry at that time to take up digital signal processing techniques for telecoms. So you came to them with the idea of bringing these techniques that you had developed in your thesis and making use of that with the telephone network. Absolutely. That was my idea as to why I went there. That was not their idea! You spent some time trying to convince them? I spent some time trying to convince them. I wrote a paper, an internal memorandum that essentially said that this is the kind of thing that we shall be using in years to come. I suggested that the organization should invest some money in this area and also should get some young people to try and research further into it. So what you were proposing was just a study of digital filters that might be used in the telephone system. No, no, the objective was really to make things to switch over to the digital techniques and do all the filtering in that domain. The channel filtering and frequency cancellation and all that kind of thing to be done digitally. That was what I proposed. And you believed at that point in 1968 that was coming? All those things would be done digitally? And how widely held was that view? I’ll tell you I was called in by the deputy director. There were three other present. My deputy director called me in and said, "Sit down. I've read your paper. It's very interesting. Really fascinating. But I would like to know something very important. It seems to me that you have a solution that is looking for a problem." I said, "Will you not invest anything?" And he said very emphatically, "No, digital techniques have no place in telephony.”!! I wish he were alive now. I'd give him a present of a mobile telephone. Soon after this meeting I left and I came to Imperial. What did you gain from those years at the Hill? I actually gained something, quite frankly quite a lot. I gained firstly a sense of order because when you are a young man at a university and you have all these new ideas scattered on a plane or surface and you do not know which one to do first and so and so, you can't actually—well get lost. The systematic way of treating knowledge is not something that young people like to do. I went to an organization which was well streamlined. And I had to do certain things by certain times, and that actually taught me some discipline. So that's on the personal side, but on the scientific side I have learned that you cannot move people by pure force of argument. They have to see, particularly on the engineering side, they have to see the immediate benefit and the long term benefit of all that before they can adopt new ideas. Of course the telephone system is one of the oldest branches of electrical engineering and they had very highly developed techniques for doing everything. Absolutely. They said to me, "We are now developing repeaters to be placed in cables, in Trans-Atlantic cables, which would last for thirty years." Well, of course they didn't because we had satellites soon afterwards, and cable communication was almost obsolete soon after that! Yes. You told me before about this 1967 symposium on digital filters at Imperial College. Can you give a background of that? Yes. At that time at Imperial College was another young man who had bright ideas who was very interested in speech processing. It was Bob Bogner who is now in Australia. He invited me to give a seminar here when I was at the Post Office. I came and gave a seminar and I think I fired the enthusiasm of the young researchers, the Ph.D. students here, so much so that I was invited to attend their weekly internal seminars and advise them on the work that they were doing or about to start. I started making links with them and conditioning their thinking and influencing how their research was going to go and so forth. So I've gotten people getting more interested in the digital signal processing. After about a year or so or maybe not have been that long, Bob and I sat down and I said, "We have no means of exchanging common experiences." I used to communicate with people in the United States at that time by letter on what we had been doing. And I thought it would be a good idea then to put together a one or two day event where everybody would gather around and talk about their own experiences in this new area. And we organized the first one. We called it I think the Digital Filtering Symposium. Digital Filtering Symposium. Okay and that was ’67? And how many people would you guess attended? Founders of the field who were at this symposium. Well I guess to try and stay in chronological order, then in ’68 it was that you came to Imperial College? Yes, ’68. I came as a lecturer in ’68. What was your own work at that time? My research work was on the design on still trying to sort out some of the design of digital filters. Was your approach to try to achieve classical filter types in digital filters? Your link is at a more abstract level. These filter types. I tried to tie the other few things that were still hanging around unresolved. And then of course I started gathering students around me who started looking at the applications of these techniques. Now what was happening there in the second half of the late ‘60s that made more and more people interested in these techniques? I mean the fact that you could get fifty people taking part in a symposium and that there were young people wanting to do their dissertation in this field? I suspect the appearance of digital circuits. The LSI technology started producing the components that we needed. They’re not very fast, not very good, not very powerful, but they were there. And you could see and you could hear all these people that were producing the LSI chips. Two years from now it will twice as fast, five times as fast, and it will be ten times smaller. All these predictions came to be true so there was a good symbiotic relationship between theory of TSP on one hand and hardware on the other. And one fueled the other and escalated things in an exponential way. You already mentioned speech processing as a principal area of work. Right. Speech processing was the fundamental area, the core from which the outgrowth of theory and practice came. So almost all this work was people who were somehow dealing with speech transmission analysis, synthesis, all those areas. Rather than-- I mean one area in the United States was the geophysical signal processing that devised digital filters at an early stage. Did you see other application areas here that were important in those early years? Not really, I didn't. Speech was the area that Bob Bogner was concerned with. That's why there was no conflict of interests. So in the UK that was the area of burning interest as well as in the United States. Geophysical prospecting was interesting, because in the early days it tried to do digital processing using analog techniques because they used the saturating geophones. And then later on, Robinson and his work extended and incorporated all these DSP methods. There was a second symposium in ’69 is that right? Yes, in London again, at Imperial College. And I should have asked. Who were the organizers of the first one? Myself and Bogner. The second one we had also incorporated Peter Rayner from Cambridge. Was it your intention to do this every other year? No, but we were asked because there was nothing else. No other organization, no other body was taking up this subject to organize to bring together international workers to do some exchange of views. When they saw the value the first time, they said, “Can we do it again?” Two years later, we did it again. “Can we do it again?” I said, “I've done it twice. It’s a lot of work. Would someone else do it?” And Cappellini from Italy suggested that he would like to do it. After all he has links with some organizations that might take it on and run it as a business. And this is what happened after that. It continued to be a biennial symposium? Well, it’s very impressive that such a thing has lasted. The thing about it, Rick, is that it proved itself not only as a viable proposition from the theoretical point of view, but also as a business because actually everybody paid. The symposium paid for itself. It’s very difficult to organize meetings that do not have a deficit, and this paid for itself. Was that because Cappellini was a good manager? No but rather, I think it’s because there was a need for it. People realized that there was this event, and they came and they prepared for it, and until the IEEE started the Signal Processing Society, the precursor to the Signal Processing Society organized the first symposium. Then every body came to this. Most of the people came to this. Of course all the meetings of the audio- and electro-acoustics group as it was called during the ‘60s were in the United States and there must have been a need for a European site. I wanted to ask you about new publication possibilities. As you know, the Transactions of the Audio and Electro-acoustics Group became a place for publication. What other journals were places? Now did they have a circuits and systems group? Something comparable? No, at that time the Proceedings were only one journal. Now it’s split into several, but in those days it was one journal and it was very difficult to get anything published until I had a standing row with the editor and got something published and then gradually they started accepting papers in DSP. I saw a listing of the technical groups of the IEE, and it seems to me that signal processing is not one of them. It’s within another one, is that right? No, signal processing has its own professional group, but it is not a division. It is within the electronics and communications division. Okay, I see. Does that mean that it doesn’t have its own transactions of the IEE? No, it doesn’t. We have the parts, I think it’s part “F”, which is signal processing and communications. Okay. To pursue this idea, there was also the formation of the European Society for Signal Processing. That came much later. In my own experience, I was helped by my advisor to get on to various committees of the IEE and that way I managed to inculcate a positive attitude towards DSP and to help those other people who started working there to publish in the proceedings of the IEE as well. And then in the early ‘80s we had one of the meetings of the symposium that we had, which was held in Florence. We had roughly about fifty people deciding to form the European Association for Signal Processing. I remember it was a very interesting word for a drinking event! We had a meeting and for one reason or another they thought that I should be the first president of the association. I was elected the first president. We established the signal processing journal and we went from there. I know you have always been active in the IEEE’s group. It was felt that there needed to be a European organization because the other was so based in the United States? Yes, it wasn't that it was based in the United States. Now the IEEE is an international organization. Twenty-thirty years ago it was a different organization. It was not international, but more centered around New York. It was spreading out with a peak around New York and the spreading was very thin elsewhere. Again, we must remember that the symposia, the ICASSP symposium for 2000 for example will be in Istanbul. This year it's going to be in Phoenix. The year before was somewhere else. We think of the world as anywhere. We can hold them anywhere in the world. That wasn't so then. And it was very difficult for us to go to the states. Very expensive for us to go to the States every year to the meetings that started being held. It was really to provide a point of focus for us to get together every two years I think to exchange, again, views on the subject. But it must also have been in order to have this new European journal of signal processing, to not have to publish in the IEEE transactions. And looking back on it almost twenty years later how has it worked out? That journal? I think it was the wrong decision. I tell you why it is the wrong decision. I think that there was a period of negative feeling, that we the Europeans were trying to do something different or trying to break up the cohesion of this international spirit that was around and so forth. But I think the thing which is-- The reason why I think I would say it is wrong is that the level of scientific standards is not as high as the IEEE transactions. Some of the papers in the signal processing journal are outstanding, but a lot of them aren’t. So that waters it down somewhat. The average level is, I think, somewhat lower. And I think that’s wrong, because when you accept that situation then really we’re not doing our job. You were president the first year? I was president for the first three years. First three years, I see. I was president for the first three years. The constitution that was adopted at that time was very restrictive, in that it did not allow certain things to happen. It allowed certain things to perpetuate. For example, I could have been president for life and I said, “This is nonsense.” I don’t want to do it. I don’t want to be president in the first place. I have other things to do. Better things to do. I have my research to do. But we must change the constitution. So we canvassed a two thirds majority and voted a new constitution, which when you have eighty members, two thirds majority at that time wasn’t too bad actually. It was easy to get to two thirds. The constitution was changed. When it was changed, this is right. Get the vice president to be the president next time. I stepped down from the position. Was that prompted also by difficulties or frustrations with the job or simply that you had given a certain amount of time to that and you wanted to get back to your own work? Well I did that job for three years and I traveled around Europe at a time when it was actually not so easy to travel. Now it's very easy. I can go to Waterloo Station here in London, and get the train and go to Paris in three hours. At that time to fly in it was not easy. Doing that job for three years when you have other things to do, which I perceived in my opinion were more important things, having given the association three years of my time, and put it on what I thought was a rational footing, a reasonable structure, then I think it's important that I step down. And in any case, people run out of ideas about what do you do next as a president? That's not something that stimulates me. It's not a position that I aspire towards, or find fascinating. But you felt it went well as far as establishing this new organization and this publication was started. How did the EURASIP conferences go? The first one was held in Lausanne. It actually went very well. We had about two hundred or so participants. But then it benefited from the fact that the precursor to this thing, which is the symposium that I organized, would happen to be on the same year and we decided not to hold it. So people came to the EUSIPCO. So it benefited by inheritance, if you like. And it took off from there. I see. And it continues today, every other year, and is doing well? That’s right. It’s doing well, yes. Could we return to your research? You said that you were working on techniques of filter design and you started to attract students here. Can you tell more of the story? Yes, because I was the youngest member of the department, I started organizing impromptu seminars. Kind of there’s an element of proselytizing in this and I managed to persuade younger people, students, to join and do their Ph.D. with me on various aspects on various aspects of digital filter design, spreading it into applications as well. Encroaching applications, applying it to various areas. And the words fell on to very fertile ground because everybody now, the younger generation, saw precisely that what I was saying was really the future. I soon amassed about something like fifteen Ph.D. students, which was a large number. Well some of the theses you see on my shelves across the room. Some of those people now are occupying crucial positions around the world. They are well known professors, those who went to academia. But not all went into academia, as some also went to industry around the world. Any where you go now you're bound to find one of my old graduate students! How many graduate students have you had over the years? Do you know? No, no, just Ph.D. students. So that was a very large part of your work I believe over the years. That’s right. That was a large part of my work. Master’s students didn’t actually start until much, much later. That’s about fifteen years ago I think. We started Master’s students. We clearly don’t have time to talk about these individually, but maybe you could mention one or two of these Ph.D. projects that have been notable or that you’re particularly proud of. The work on the application of filters into telephony. Digital filters into telephony, which was done by Victor Lawrence, who is now one of the bosses at Lucent Technologies in the United States, is worth mentioning. The work that was done by Stuart Lawson on low sensitivity filter design. Stuart Lawson is now at Warwick University in the UK. The work on finite precision coefficient design was done by Yong Ching Lim who is now a professor at Singapore University. The finite field operations for transforms and filters that was done by Wan-Chi Siu who is a professor at Hong Kong is worthwhile. As you can see I didn’t actually stick to the straight and narrow of filter design, but was branching out. Because as these students came and the team enlarged, the interests spread more and more. So we encompassed many other activities, which were subsumed under the umbrella of signal processing. I've had professors tell me that very soon virtually all of their research was actually going on through graduate students. Did you have your own research agenda? Yes! I still have my own research agenda. I have my own little side line, which takes second position to the interest of my students. Can you tell me what has been your own particular interest over the last couple of decades? The last five years my interest has been in modeling signals which are non-stationary and non-Gaussian and probably come from non-linear operations. So all the “nons”. Non-stationary, non-Gaussian, non-linear. This is what I've been concerned with. I said to myself what is a difficult subject? Well that one. Okay, let’s have a look and see what we can do. It’s sort of chipping away. Small chips, but one day working, we’ll hit a vein and then we’ll start mining. Now is this because you’re looking at the field abstractly or theoretically and you see that these are some areas that need work or is it prompted by some actual signals that are coming up that are not dealt with well by existing models? I think it’s a bit of both to tell you the truth. I tend to be much more abstract in my approach, but I know from the work that we’ve done in say speech or image compression, that we’ve got as much as we can get out of the operations that are currently being used every where. We cannot squeeze any more out of them. And why? Because there are certain assumptions that we make, which are not quite true. So you go back to the beginning and say, “Okay. How can I make those assumptions more true?” And then you drop into the theoretical side and you say, “Okay, that means because it’s non-stationary and non-Gaussian and probably non-linear.” That’s the reason why. So perhaps the stimulus is because we can’t get any more, we can’t get any better speech compression, speech quality. Why? Because of all this. I mean one percent improvement is not very good. We can push. People have been right??? One percent improvement in speech compression or recognition rates or whatever. But how do you get ten percent? Fifteen percent? Yes, it usually requires some new techniques. I wonder if you could comment on the view from Europe of the development of signal processing. Europe has of course a very proud and distinguished tradition in engineering and I think especially the theoretical side, the mathematical approach to engineering. Has that been visible in the development of signal processing do you think? Yes, I think it has. I think the reasons why we have spent more time thinking about things. It comes out of some fundamental limitations rather than anything else. And the limitations are of financial nature. We need to look at all facets of the problem, or at least those that we can see, and explore those before we commit any investment to the development of products. So that in some way holds back the product line. In the United States, it's somewhat different. A new idea, even if it only might work, receives funding. This is how we see our USA friends. The theoretical developments that we have seen over the last ten, fifteen, twenty years are really things like design techniques for large DSP systems. Like the constant modulus algorithms that we now have in mobile communications. And a lot of the early work on finite field operations. These are things that happen because people started thinking. "Well, I only have one penny. How do I spend that penny?" That's my theory. You may disagree with it. No, I think that it actually meshes with what I've heard from other people that it was easier to get industry support in the United States for signal processing research than in Europe. At least in the early years. It’s probably changed. Well, thank you very much. Is there anything I haven’t asked about you’d like to comment on? Like what other things apart from DSP do you do? I want to tell you because there’s something. Recently I have been appointed to a chair in Archeology as well. That's right. At the University College London. And that's one of the things that I followed when I was an undergraduate student. I studied a bit of Archeology. I had some papers published. I don't list them in my publications, but I have written papers in this rather different area of Archaeology! So you’ve pursued that interest over the years? Yes, as a hobby. But the University College, the Institute of Archeology, thought that it might be a good idea if I had some links with them. It’s something that I'm very happy with. Does that mean you’re going to be doing more research in archeology? That means I'm going to continue the same way. Only that they have a room and a desk and a secretary for me over there. That’s very nice. Will you be teaching over there? No, I won’t be teaching, just doing research. That’s very nice. And there’s no connection I think of between archeology and DSP? None at all. You know, it’s the right brain hemisphere and left brain hemisphere. There’s a great division between them. That is very interesting. Any other things you’d like to say? This page was last edited on 1 February 2019, at 19:18.